Super Lawyers status is limited to the top 5 percent of Michigan attorneys. Our law firm and attorneys focus on truly helping people who have been seriously injured in car accidents throughout the state. Being named to this list by Super Lawyers is, in my opinion, as much a testament to this caring and communication as it is to our top reported motor vehicle accident settlements and trial verdicts we’ve recovered for our clients. It is a true reflection of the way everyone at our law firm treats the people we’re entrusted with helping after terrible car and truck accidents all across the state. We care about our clients – and everyone here works hard to provide great communication, care, dedication and respect while we’re litigating their auto accident cases. Steven M. Gursten: It’s always a little awkward writing about myself. I’ve been handling very serious car accident and truck accident injury cases and wrongful death cases for over 20 years. I’ve been named a Michigan Lawyers Weekly Lawyer of the Year, and a Leader in the Law for my work promoting truck safety. I am the current president of the Motor Vehicle Trial Lawyers Association, Past-President of the American Association for Justice Truck Accident Lawyer Group and I’ve been selected as a Best Lawyers in Michigan Lawyer of the Year for 2016-2017. Lawrence E. Gursten: Larry is the founding partner of Michigan Auto Law, and his legal career as one of the top auto accident attorneys in the country spans more than 40 years. He started his career with the highest score on the Michigan Bar Exam, and continues even today to passionately advocate for auto accident victims throughout the state. He has been called Michigan’s “auto law guru” by Michigan Lawyers Weekly and is considered one of the most knowledgeable attorneys in the state on Michigan’s auto No Fault insurance laws. Leonard M. Koltonow: Lenny is a partner and has been a top trial lawyer with Michigan Auto Law for 35 years. He has been named one of the top trial attorneys in the state by the Michigan Association for Justice and the National Trial Lawyers Association. Lenny achieves excellent settlement results and jury verdicts for his clients who are all very serious auto accident victims, including his latest jury verdict in Detroit of $1.45 million on an insurance company offer of $400,000 in a strongly contested truck accident negligence and injury case. Lenny is also a respected court-appointed special case evaluator and arbitrator. 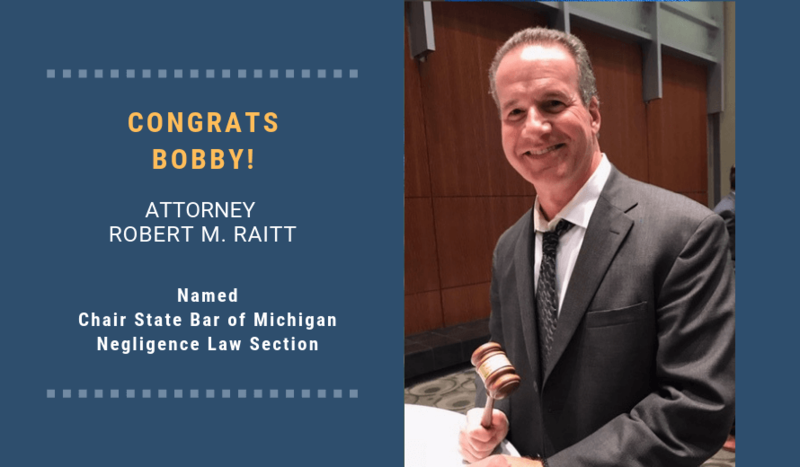 Robert M. Raitt: Bobby is a Michigan Auto Law partner. He is past-president of the Michigan Association for Justice – a victims’ rights organization comprised of over 2,000 Michigan personal injury attorneys. In 2015, Bob received a $4.6 million verdict in a traumatic brain injury million-dollar verdict in Wayne County. He has received many legal awards and honors, including a Best Lawyers in Michigan designation (limited to the top 2.4% of all Michigan attorneys), and he works tirelessly for those injured in auto accidents. Kevin H. Seiferheld: Kevin H. Seiferheld has been a top trial lawyer at Michigan Auto Law for 15 years. Kevin specializes in high-stakes litigation involving very serious car crashes and auto No-Fault insurance cases, such as those requiring attendant care for catastrophic injuries. He also focuses on municipal vehicle accident cases such as those involving city and municipal buses that cause serious injury bus accidents and commercial vehicle crashes. Kevin has obtained millions of dollars for his injured clients, and is a tenacious fighter both inside and out of the courtroom. Ian M. Freed: Ian specializes in truck accident and very serious auto No Fault insurance cases, including those involving years of attendant care for those who have suffered catastrophic neck and back injuries and traumatic brain injury. Ian has extensive experience in auto negligence and insurance coverage disputes. Ian is licensed to practice throughout the state, including in the U.S. District Court for the Eastern District of Michigan. He is known and respected for his working very closely with his clients, and aggressively defending their legal rights. Thomas M. James: Tom focuses his practice in auto accidents, first-party lawsuits, attendant care claims, truck accident litigation and insurance coverage disputes. With more than 25 trials, Tom is considered one of the leading personal injury trial attorneys in Michigan, and he is also a caring advocate for his clients. He’s passionate about holding auto insurance companies accountable for refusing to honor their legal obligations and their contractual promises to customers. Brandon M. Hewitt: Brandon is a trial attorney in Michigan Auto Law’s West Michigan law office in downtown Grand Rapids. He prides himself on providing his clients with extraordinary caring and communication, and his injury settlements reflect this attention. Brandon’s clients have the confidence that they’re in the hands of an advocate with a proven record of top injury settlements. Complete client satisfaction and confidence is Brandon’s top priority. Brandon is also the Chief Operations Officer of Michigan Auto Law. Super Lawyers, a Thomson Reuters publication, is a listing of outstanding lawyers in Michigan. The organization employs a selection process that combines peer nominations and evaluations with third-party research. Each attorney who receives a Super Lawyer designation is evaluated on 12 indicators of peer recognition, professional achievement and legal excellence. Tomorrow, I’ll talk about the Michigan Auto Law automobile accident attorneys who were picked as the top “Rising Stars” by Super Lawyers.